Sage North America is reintroducing its Sage Summit conference in 2019. Instead of one big conference, Sage has decided to host two conferences – one on the West Coast and one on the East Coast. During 2018 Sage hosted a series of six one-day Sage Sessions events across North America. These events were designed to be more convenient for customers and partners to attend since many would not have to travel overnight to reach one of the six stops on the Sage Session tour. We are thrilled to bring back Sage Summit in 2019 at two locations! You are invited to join us in San Diego on Feb 13–15 or in Atlanta on May 13–15. With an audience of accountants, small-to-medium-sized businesses, and partners, we will focus on global cloud technology with relevant content, connections, and experiences that will provide actionable takeaways for future business success. Each Sage Summit event will kick-off with an exclusive Partner’s Day, where you will learn more from Sage executives on market changes, our product strategy and dive deeper into product integrations. The day will end with a Welcome Reception for all Summit attendees. Sage Sessions: Construction and Real Estate will be held in Portland, OR, on April 24-26, and will focus exclusively on Sage CRE solutions. For Sage Business Cloud Enterprise Management, Sage Sessions: Enterprise Management will be held in October 2019. Separate communications will be sent with more details for those events. APS Payments – integrated payment processing ( credit card, ACH ) for Sage 100 & Sage 100cloud, Sage 300 & Sage 300cloud, Acumatica, Adagio, SAP B1 and QuickBooks. 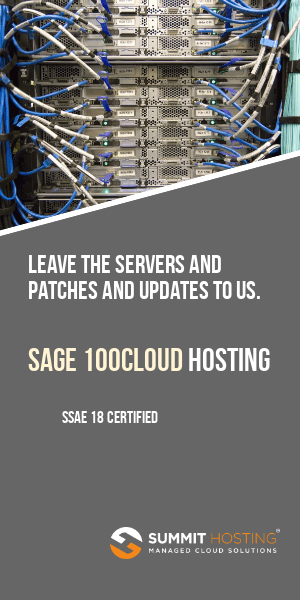 Summit Hosting – secure cloud hosting for Sage 100 & Sage 100cloud, Sage 50, Sage 100 Contractor, Sage 300, Sage 500, Sage Enterprise Management ( X3 ), Sage BusinessWorks, Sage CRM, Sage Fixed Assets, Sage HRMS, QuickBooks. Registration for Sage Summit San Diego and Atlanta open on November 20, 2018, and February 13, 2019, respectively. Pricing and a detailed agenda should be available shortly before the start of registration. The content for both of the Sage Summit events will be identical so you only need to register for one event.